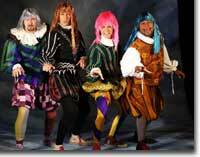 Like most arts organizations, the Colorado Shakespeare Festival has tightened its belt in order to weather the current recession, so rather than present The Complete Works of William Shakespeare (Abridged) as its fourth play this season, the decision was made to present an original comedic review that director John Dennis and his actors would collaboratively create. This process would save royalty fees and (hopefully) entertain and fill seats in the indoor theatre. Well, they got two out of three—the festival's not paying for the rights to perform someone else's copyrighted work, and thanks to positive reviews from the same critics that enjoyed the aforementioned zany satire, Shakespeare in Briefs is putting people in the seats. But whether such an exhibition of sophomoric, scatological, and slapstick humor is entertaining is a matter of taste. In the Dramaturg's Notes in the program, we are told that burlesquing the Bard is a longstanding tradition in the theatre, and various examples are given of such efforts. But the examples are all well over 100 years old. Modern plays that use Shakespearean premises, like Tom Stoppard's Rosencrantz and Guildenstern Are Dead or Lee Blessing's Fortenbras are centered around characters from the canon, have an actual plot, and mix humor with such revolutionary emotions as angst and irony. Like The Complete Works of William Shakespeare (Abridged), Shakespeare in Briefs uses the modus operandi of beginning each sketch with a scene from Shakespeare and creating comedic action that ultimately has nothing to do with Shakespeare, sort of like Monty Python meets Animal House. To be fair the ten year old girl sitting in front of me and some of the collegians in the audience found portions of these attempts funny, especially seeing men in sequined melon-filled brassieres speaking in falsetto, but for those in the audience that had evolved since adolescence, such repetitious visual puns tired quickly. Extended improvisation is not everyone's cup of tea. It seems to work great in clubs where, whetted by alcohol, the audience is wont to indulge themselves in self-mockery and mediocrity. In the context of a Shakespeare festival, however, this sort of shallowness seems out of place; even the bard's most physical comedies included plot and social commentary. There is a reason that burlesque died—we outgrew it. The Colorado Shakespeare Festival's production of Shakespeare in Briefs runs in repertory with Macbeth, Richard III, and A Midsummer Night's Dream through August 16th. 303-492-0554.